This Cadbury Dairy Milk Cake is perfect one to make your beloved happy and sure to make her smile. C..
Chocolate Indulgence United King Bakery - A unique combination of dark and white chocolate in layers.. 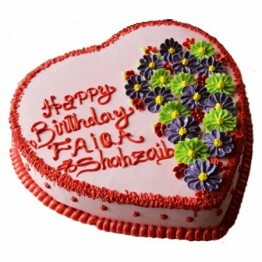 The cake looks extremely yummy and will surely leave the receiver’s palates with desire of wanting m..
A rich hazelnut flavoured chocolate cake, fresh butter and other excellent cake ingredients and deco..
Fresh seasonal flowers bouquet for delivery across Pakistan with 5 Kg Assorted seasonal fruit basket..
Get a lovely and charming cake for your loved one with these delicious cake which is so pretty, Sati.. Kit Kat cake with filling of kitkat wafers in the top layer along with melted kitkat chocolate coati..
Get a beautiful bunch of Roses, Carnations & Lilies delicately wrapped in paper packing and pink..
Anniversaries are an important opportunity to stop and take time to reflect on the significance of a particular person, day or time in our life. 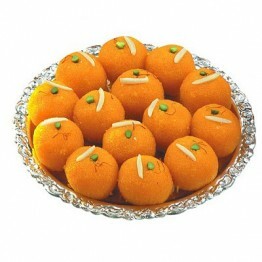 Avail this opportunity and let your loved ones acknowledge their importance in your life. 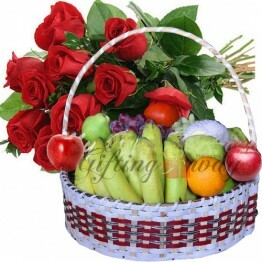 We, www.giftingway.com, offer a variety of the latest, up-to-date, gifting items suitable for all ages and genders for this auspicious occasion of your love. 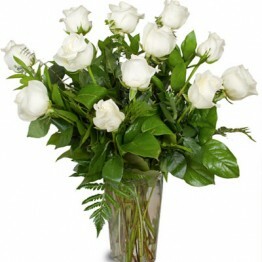 Every flower has a meaning of its own but they all symbolize one main article i.e., “LOVE”. 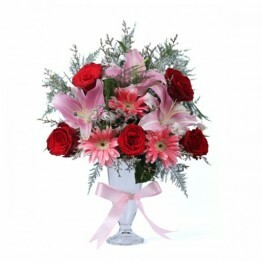 Personalize your gift with deeper sentiment by choosing the color and number of flowers. 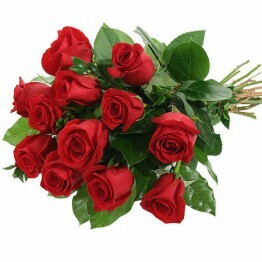 Roses are known as the king of flowers, no other flowers surpass it for its beauty, color and fragrance. Inspired by roses, people developed a language of colour. 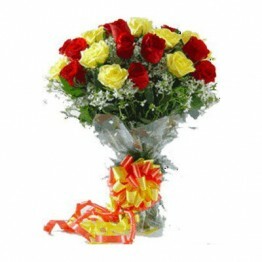 Let her know that she is no less than a queen of heart and hence deserves the king of flowers itself and break in through the boundaries of your beloved’s heart, with a bunch of 24 lush red roses magnificently tied with a beautiful bow and embedded by your sincere and unlimited love & affection. 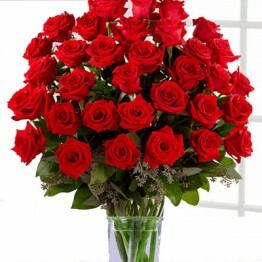 The more, the better, as the greater quantity occupies a bigger part of the heart we also offer 3 dozen of our luxurious red roses elegantly placed in a crystal vase along with some greens that will create an extra special aura of love. When just a bunch of roses aren’t enough, our combination of bunch of pink roses with 2 lbs state-of-the-art quality cake is sure to do the magic. Is she fed up of the same old red roses on every anniversary? 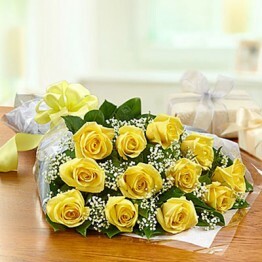 Diversify with a dozen of our freshly imported, long stemmed yellow roses and watch her eyes glow like ember. 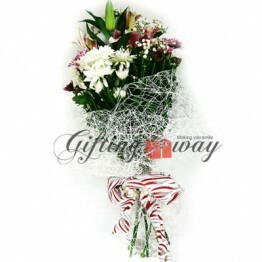 Want to surprise her in an unexpected gesture? 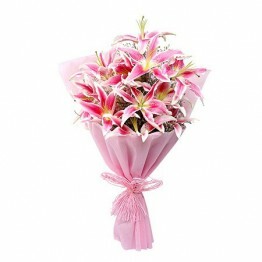 Deliver a bouquet of our lush luxuriant lilies wrapped elegantly to see their eyes sparkle like diamond. 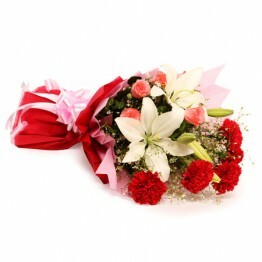 Our mixed flower anniversary bouquet is the right way to express your love to someone who doesn’t know your mixed feelings for them. 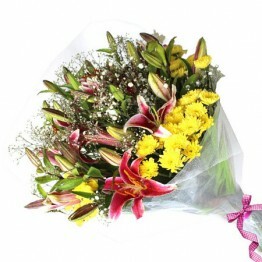 They include a combination of our own handpicked yellow and white daisies, pink lilies, and baby’s breath. 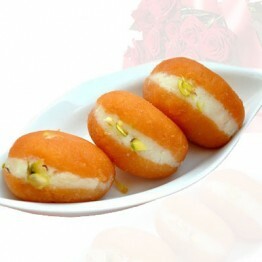 When talking about anniversary gifts, how can one forget the very important fruits. 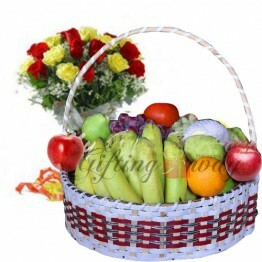 Fruits are the most significant part of our daily lives as their fresh scent brightens up our dull day and their colorfulness adds life to our surroundings. 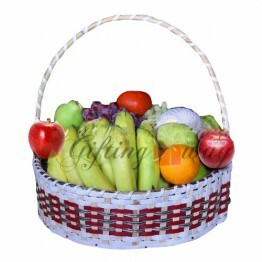 Delight your dear ones with our fresh, handpicked, juicy fruits and let us handle the rest. 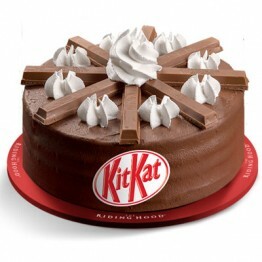 Who doesn’t wish for a double layered chocolate cake garnished with KitKat chocolate wafers? We offer a KitKat chocolate cake weighing 3 lbs from the red riding hood bakery. Surprise your loved one and let the chocolate do the rest of the work. 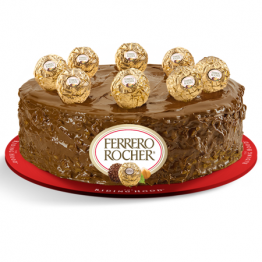 One of our specialties is the tantalizing Ferrero Roche Cake direct from the kitchen of the five star Red Riding Hood bakery. 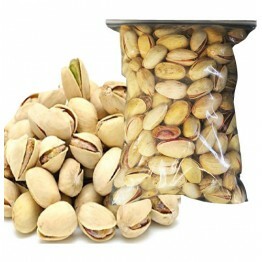 Ferrero Roche, being a world famous chocolate is enjoyed and preferred by most. 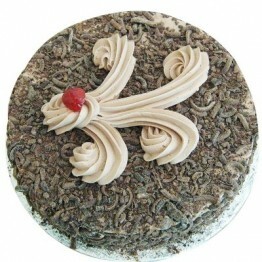 Order this enchanted cake and put a spell over your beloved. 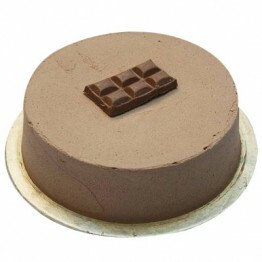 Along with that we offer the delicious Cadbury dairy milk cake weighing 2 lbs for all the chocolate lovers out there. 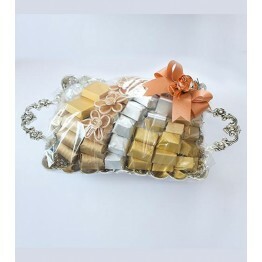 Fascinate the dear chocolate lovers and make their day. 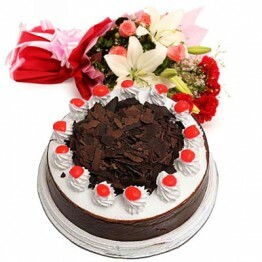 We also provide with the delicious heart shaped cake with flower garnishing and the names of the love birds written on it, fresh from the kitchen cuisine. 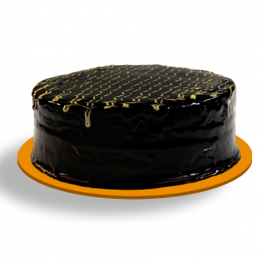 Our extensive variety also includes the one and only yummilicious Swiss cake from a five star bakery to add life to your day. 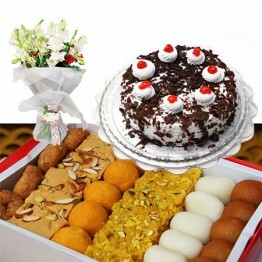 To make your gift extra special we also provide you with the opportunity of gifting your loved ones with our extra special combination of a mix flower bouquet, 2 kg Mix Mithai with a delicious black forest cake as the cherry on top and rob them off their guards and widen your room in their hearts. 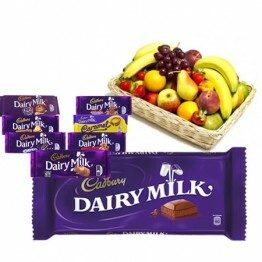 Deliver our super delicious combo of fruits and Cadbury basket to their doorstep and enjoy the rest of the day with their smile. We proudly claim that our products are satisfying and of good quality as we have the support of the leading bakeries which include red riding hood bakery and kitchen cuisine. We have much more to offer than just the looks of it. Once you deliver, you’ll do it again. You Can Send anniversary gifts for her & him, anniversary gifts by year, anniversary gifts for parents, anniversary gift ideas, anniversary gifts for boyfriend, anniversary gifts for husband.